New research from Mercy Corps and the Joan B. Kroc Institute for Peace and Justice finds that access to secondary education reduces support for violent extremist groups. Researchers from the Joan B. Kroc Institute for Peace and Justice and Mercy Corps designed a study to help understand how secondary education affects young people’s support for political violence. We focused on the Somali Youth Learners Initiative (SYLI), a USAID-funded program implemented by Mercy Corps and other partners. 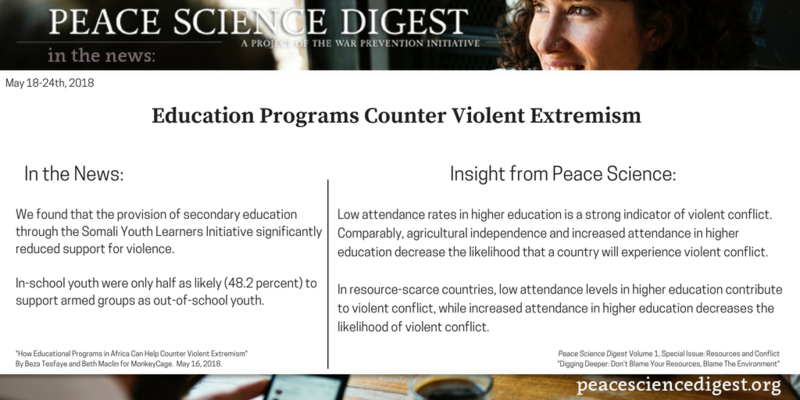 In resource-scarce countries, low attendance levels in higher education contribute to violent conflict. In resource-scarce countries, high attendance levels in higher education decrease the likelihood of violent conflict. Agricultural dependence, poverty, and low attendance of higher education (i.e. universities, colleges, trade or technical training) are strong indicators for violent conflict. Comparably, agricultural independence and increased attendance in higher education are strong indicators that a resource-scarce country will not experience violent conflict. “How Educational Programs in Africa Can Help Counter Violent Extremism”. By Beza Tesfaye and Beth Maclin for MonkeyCage. May 16, 2018. Are Alliances a Prerequisite for Multiparty War?